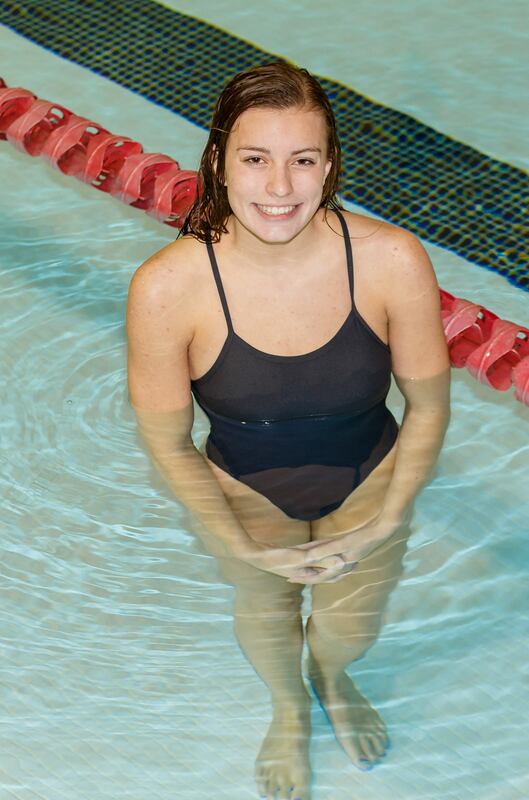 Last Saturday Brookfield East junior Leah Westcott qualified for the WIAA Girls State Swimming Tournament at the UW-Natatorium in Madison. That is nothing new for the talented Spartan. Westcott is making her third straight trip to state in the 200 individual medley and the 500 freestyle. She will be looking to place in the top 16, something she has never done. Westcott will take some impressive momentum into Madison. She won the sectional in the 200 IM with a time of 2 minutes, 7.33 seconds and finished second in the 500 free at 5:00.6. Both were lifetime best times by a good margin (2.5 seconds in the IM and 9 seconds in the 500). She also led off the state-qualifying 400 free relay team which set a school record by more than 2 seconds. "She was pretty great at the meet," East coach Michael Rose said. Going to state was something Westcott had her eye on all season. "One of my main goals was to go back to state again," she said. "This is my third year going. I want to place better. I had some specific times, (in mind). I wanted to get a best time or drop two seconds in the IM and five in my 500." Westcott talked about her favorite races, the 200 IM and 500 free. "Usually swimmers are better at distance swimming or sprint swimming," she said. "And my pace would be distance. So I'm training longer races. In the individual medley I would do every stroke. "It's something you decided or fall into at a younger age. Then as you get older you just specialize in that a little more. Those are the two events I've swam all my years here." Westcott is a veteran at making the trip to state, but recently she recalled going to state her first season. "My freshman experience helped a lot," Westcott said. "You compete against every age. Going into blocks, you look around and there are swimmers older and bigger than you and you will know what you are capable of doing." Westcott has been successful since donning the East colors. She won the Greater Metro Conference 500 free the last two seasons - she was second as a freshman - and was second in the 200 IM all three years. Like several athletes, Westcott started competing at a young age. 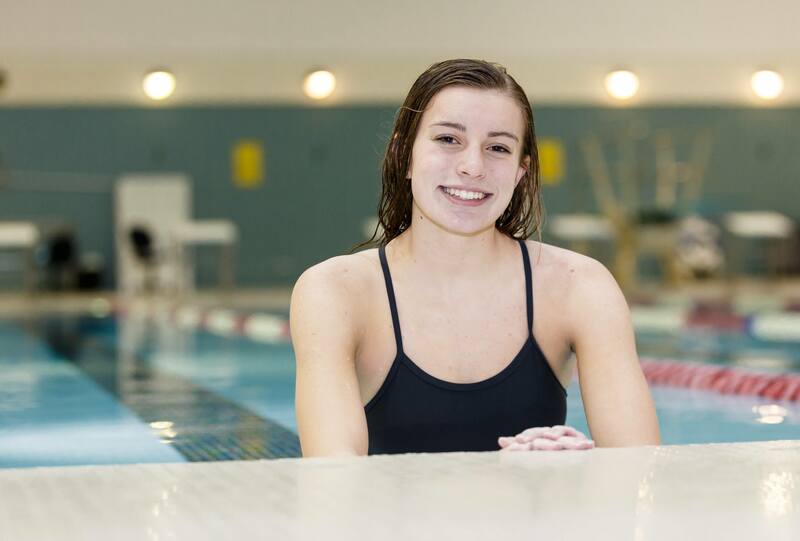 She joined the Elmbrook Swim Club when she was 6 years old because her sister, Jessica, was a member and eventually went on to become a good swimmer at East. "I had (wanted) to do everything she did," Leah said of following in Jessica's footsteps. "I decided to join the club and basically, I've been following her ever since." Leah enjoyed swimming at a young age for many reasons. "Swimming is something you can do recreationally," she said. "You do it and your family has a lot of fun. The sport attracted me because it was something different than what the other kids were doing at the time. You meet a lot of people that you didn't know before. That really kept me in the sport." Rose, the long-time Spartan coach was well aware of Leah, having her in a swim class when she was 6 years old. "She started swimming competitively at 7-8 years old," Rose recalled. "She got good fast as a little kid. At 9-10 she was a zone qualifier. At 11-12 - with the Elmbrook Swim Club - he swam the 500 and the 1500. She made the varsity as a freshman and got good pretty quickly." Rose talked about coaching Westcott. "She is incredibly smart and easy to work with," he said. "She combines brains and physical skill. She is extremely coachable. She is a thinker, so she is easy to coach. She tells you what she needs. She has a good understanding of that." Westcott enjoys working with Rose and appreciates how he coaches his swimmers. "I'm very thankful that because of the Elmbrook Swim Club, I've known coach Rose for a while," she said. "He specializes in sets a lot. He knows everyone individually and that's a lot of help. He knows the events I want to do well in, so he will change the sets and really hone in on the girls’ goals and tries to help them." Rose explained how he works sets with Westcott. "She is one of the only kids who does distance," he said. "She does a lot of stuff on her own. It's a combination of working on distance and the IM. She is unique enough and we have enough space that she can work out in her own lane. We can focus directly on what she needs to work on. It's nice for both of us." Westcott talked about her strengths in and out of the pool. "Knowing what I have to do to get better," she quickly said when asked about her strengths. "I like to set goals and each practice I try to push myself harder. That has really helped me being confident going into a meet. I know I've done this before. I hopefully will get a best time and good outcome." But Westcott knows there are areas she can improve on. "One thing I need to get better at - we all work on in practice - are the technical things," she said. "Starts, reaction time, splits, pushing off the wall to get that extra edge." Asked about the difference between swimming in individual races vs. relays, Westcott pointed out how important relays were when it came to the meets. "A lot of the races we do individually, so those are the ones we focus on in practice," she said. "But coming into big meets, it's really important to have good relay swims. "The relays are the only events you can come together and win points as a team. They're actually more important because they win more points in meets. It's especially fun to make state in those." East has three captains this season - Melissa Torbey, Elaine Klatt and Tatiana Babikova. But Westcott also has leadership capabilities according to Rose. "She's a cool leader, a confident kid, very well-liked," he said. "She is the leader in the pool. Our captains are elected by the team previous season and we have three senior captains. They take care of stuff out of the pool - the banquet, the carbo crams. But Leah is like our quarterback - our kids look to her. She's a natural leader. She's pretty humble." Westcott feels she does have leadership tools. "I feel in a way I try to do more as a motivational leader," she said. "I try to set a good example for the girls. Showing them how to try hard and do their best in the pool. "I let them know they are doing a good job, what they did well. There could be something I'm working on, maybe they can work on it too. Having that help from previous years that I've gotten is always nice. It's a gesture that you remember for awhile." Swimming is a difficult sport, so much so that many swimmers get burned out at a young age. So I asked Leah why she liked so much. "We do a lot of work in the morning, weight lifting," she said. "But it's worth it in the final weeks of your season. You have good meets, you get closer to your goals, you feel good about yourself. You feel good as an athlete." In the end, Rose summed up his star swimmer with a litany of compliments. "She's a good person with a unique sense of humor. She's actually quite funny," he said. "She's really smart, outgoing, nice. "She is well-respected by teachers and other kids. She works hard and thinks well. She's just a great kid to coach." FAVORITE MOVIE: The Italian Job, Comedy. FAVORITE CLASS: AP U.S. History. FAVORITE PLACE YOU VISITED: San Diego. WHAT DO YOU DO TO RELAX? Cooking, talking with friends. FAVORITE SPORTS RIVALRY/ATHLETE: Brookfield Central swimming & football. MOST MEMORABLE SPORTS MOMENT: Going to sectional and qualifying for state for the first time as a freshman. WHAT WOULD YOU LIKE TO DO IN THE FUTURE? Attend a Big 10 School. Would like to swim, but Academics come first.